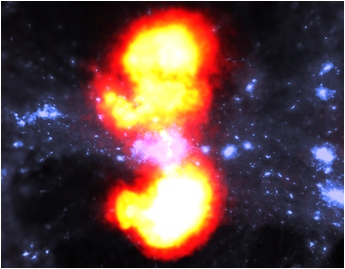 Gamma-ray emission detected by Fermi LAT (left) fills bubbles of hot gas created by the most massive stars in Cygnus X (right). The origin of cosmic rays (CRs) is a century-long puzzle. It is strongly advocated that Galactic CRs are accelerated by supernova remnant shockwaves. The CR isotopic composition and the fact that about 80% of the supernovae are produced by a massive-star core collapse establish a strong link between CR origin and massive-star forming regions. 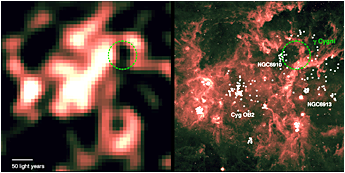 I will present the analysis of Fermi LAT observations of the Cygnus complex, which harbors the conspicuous massive-star forming region of Cygnus X at 1.4 kpc from the solar system. Gamma-ray observations can be used to trace CRs in the interstellar space interacting with the ambient gas and low-energy radiation fields. A 50-pc wide cocoon of freshly-accelerated CRs is detected in the region bounded by the ionization fronts from the young stellar clusters. On the other hand, the CR population averaged over the whole Cygnus complex on a scale of about 400 pc is similar to that found in the interstellar space near the Sun. I will discuss these results which confirm the long-standing hypothesis that massive-star forming regions host CR factories, which provide a test case to study the early phases of CR life in such a turbulent environment and which also shed a new light on the detections of TeV gamma-ray emission toward massive-star clusters. 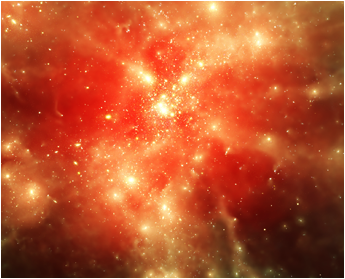 Cosmic rays fill up the entire volume of galaxies, providing an important source of heating and ionisation of the interstellar medium, and may play a significant role in the regulation of star formation and evolution of galaxies. Diffuse emissions from radio to high-energy gamma rays (> 100 MeV) arising from various interactions between cosmic rays and the interstellar gas, radiation, and magnetic fields are currently the best way to trace the intensities and spectra of cosmic rays in the Milky Way and other galaxies. In this talk, I will give an overview of the observations of the cosmic-ray induced emissions from our own and other galaxies, in particular, results from the Fermi-LAT. I will also talk about what can be deduced about the cosmic-ray origin and propagation from these data. ALFALFA is a wide-area, blind 21cm survey of galaxies in the local universe (z<0.06), performed with the Arecibo radiotelescope. The latest public data release contains about 40% of the final 7000 sq.deg. survey sky coverage, and already contains the largest HI-selected galaxy sample to date. 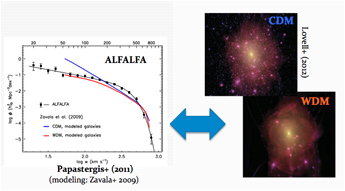 The combination of survey area and 21cm sensitivity of ALFALFA makes it ideal for addressing key questions in "near-filed" cosmology, such as the characteristics of the lowest mass galaxies and the properties of dark matter on sub-kpc scales. I will be presenting some recent results of the ALFALFA survey, relating to the properties of the lowest-mass field dwarf galaxies, the hunt for "missing satellites" and the clustering properties of HI-selected galaxies. The main focus of the talk will be on the recent statistical measurements of the abundance of galaxies as a function of their baryonic mass ("baryonic mass function of galaxies") and as a function of their rotational velocity ("velocity function of galaxies"). 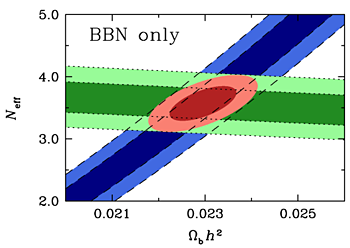 The former distribution can be used to infer the baryonic content (stars + neutral atomic gas) of dark matter halos, providing important constraints for hydrodynamic simulations of galaxy formation. The latter distribution can be used to test the halo mass function predicted by ΛCDM. In particular, a combined analysis of the abundance of low-mass galaxies and their internal gas kinematics may constitute an important new challenge of the standard cosmological model on galactic scales, corresponding to the field analog of the "too big to fail" ΛCDM challenge. Non-linear phenomena has been insufficiently used to gather information on astrophysics and cosmology. I will present two examples of such phenomena that are particularly interesting to probe dynamics of the Universe on ultra large scale (expansion of the Universe) and large scale (bulk flows): cosmic voids and kinematic Sunyaev-Zel'dovich effect. First, we will see that cosmic voids are potentially interesting, theoretically and observationally, to probe the expansion and the energy content of the Universe. Second, I will show that kSZ can be more effectively detected by concentrating the effort on the plasma halo around galaxies, again highly non-linear, to probe large scale flows and locating missing baryons. more), whereas ΛCDM predicts homogeneity at ~100 h-1 Mpc. We have tested this using the WiggleZ Dark Energy Survey, a UV-selected spectroscopic survey of ~200,000 luminous blue galaxies up to z=1, with the Anglo-Australian Telescope. The large volume and depth of WiggleZ allows us to probe the transition of the galaxy distribution to homogeneity on large scales, and see if this is consistent with a ΛCDM prediction. Conversely, the properties of small-scale inhomogeneities are an important probe of cosmology. The growth of primordial density perturbations to the large-scale structures present in the Universe today depends on the interplay between cosmic expansion and gravitational interaction. We use N-body simulations to investigate ways galaxy peculiar velocities, arising from these density inhomogeneities, can be used as an independent probe of cosmology. The Canadian Hydrogen Intensity Mapping Experiment (CHIME) is an ambitious new project designed to map the distribution of matter in the Universe, over half the sky and a broad swath of cosmic history. The newly-developed technique of Hydrogen Intensity (HI) mapping uses redshifted 21cm emission from neutral hydrogen as a 3D tracer of Large Scale Structure (LSS) in the Universe. Imprinted in the LSS is a remnant of the acoustic waves which propagated through the primordial plasma. This feature, the Baryon Acoustic Oscillation (BAO), manifests as a preferential separation scale between matter, and by charting the evolution of this scale over cosmic time, we can deduce the expansion history of the Universe. Leveraging recent developments from from the cell phone industry (cheap, low noise amplifiers) and the huge growth in digital processing power, CHIME will be a highly efficient "digital" radio telescope, a many-antenna physically-fixed structure where beams are formed and pointed through digital processing rather than with physically steered dishes or cable delays. 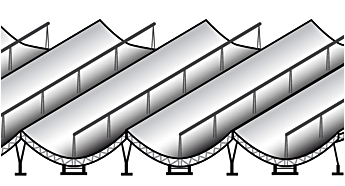 CHIME is composed of five 20m x 100m parabolic reflectors which focus radiation in one direction (east-west), while interferometry is used to resolve beams in the other (north-south), and earth rotation is used to sweep them across the sky. I will discuss the motivation, design, and progress on both the full CHIME instrument and the 1/10th-scale Pathfinder which is currently under construction. The deep gravitational potential wells of clusters of galaxies should capture fair samples of the total baryon fraction of the Universe, unless other physical processes drive baryons out of clusters. Thus precision measurements of the baryon fraction, particularly as a function of cluster halo mass, can reveal the history of baryon flux into and out of clusters. How those baryons are then apportioned between stars and intracluster gas --- the star formation efficiency --- informs models of cluster assembly and massive galaxy evolution, as well as efforts to use the cluster gas fraction to constrain the mass density and dark energy equation of state parameters. Even the partitioning of the stellar baryons alone, in and out of galaxies, tests models of cluster galaxy evolution, as intracluster stars are the final, unambiguous signature of stars stripped from cluster galaxies. We have discovered that intracluster stars are a significant part of the stellar baryons in clusters and poorer groups of galaxies. I will present new work characterizing the properties of this previously unexplored component, as well as the consequences for the cluster baryon budget and its relationship to the Universal WMAP value. Structures (''wrinkles'') in the Universe like filaments and haloes are essential components of the arrangement of matter on large scales. 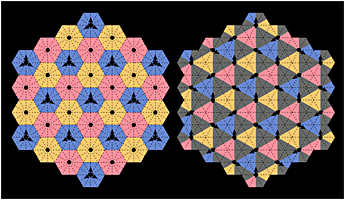 They form in analogy to the origami-folding of a sheet of dark-matter. While these structures are fascinating, and conveniently allow observers like us to exist, they also make it harder to extract cosmological information on nonlinear scales. In particular, sharp peaks greatly diminish the power of statistics in cosmology. I will discuss how largely to fix them with Gaussianization. I will present three interesting problems with neat solutions. All three come from thinking about gravitational wave detection; but the latter two are actually of broader interest. The first problem is how to arrange a handful of gravitational wave detectors to obtain the best gravitational wave telescope. In the second problem, we imagine a collection of "nodes" (e.g. satellites) exchanging laser signals, and want to know how to construct interferometric observables that are insensitive to the phase fluctuations of the lasers. Finally, the third problem begins with the question: what is the most symmetrical arrangement of 4 satellites orbits? This simple question is the doorway to the interesting subject of choreographic crystals, which I will introduce. We will explore the symmetries underlying the statistics of the primordial perturbations which seeded the temperature anisotropies of the Cosmic Microwave Background. I will show how symmetry considerations lead us to three broad classes of theories to explain these perturbations: single-field inflation, multi-field inflation, and the conformal mechanism. We will discuss the symmetries in each case and derive their model-independent consequences. I will introduce the MUSIC dataset (Marenostrum-MUltiDark Simultations of galaxy Clusters) - presently the largest sample of hydrodynamically simulated galaxy clusters, comprised of more than 700 clusters and 2000 groups. 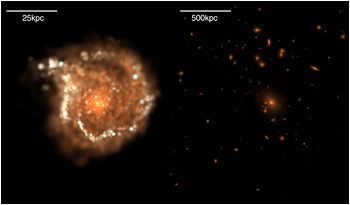 The objects have been selected from two large N-body simulations and have been resimulated at high resolution using Smoothed Particle Hydrodynamics (SPH) together with relevant physical processes that include; cooling, UV photoionization, star formation and different feedback processes associated with Supernovae explosions. The analysis of the baryon content (gas and stars) of the most massive clusters of the MUSIC dataset, performed as a function of aperture radius and redshift, is compared with the most recent observational estimates of the gas fraction in galaxy clusters, showing a good agreement when the effects of cooling and stellar feedbacks are included. A clear dependence of the gas fraction with the total cluster mass is also evident. I will present a detailed analysis of the scaling relations of the thermal SZ (Sunyaev-Zel'dovich) effect derived from MUSIC clusters. The integrated SZ brightness, Y, is one of the best observational proxies used to infer the total cluster mass, M, as SZ observations allow exploration of regions of clusters not reachable by present X-ray experiments. The analysis of the SZ scaling relations confirm the validity of the self-similar model with a very low scatter and shows a good agreement with the latest observational results, such as Planck. Furthermore, I will explore the presence of a possible redshift dependence on the Y-M scaling relation. 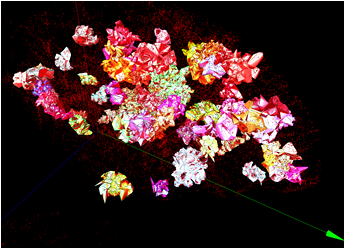 In this scope, I extend the analysis to protoclusters, objects typically at redshift higher than 1. Under the assumption of defining a protocluster only as the largest progenitor present at a specific redshift, we are able to estimate the spherical thermal component of SZE, integrated inside the virial radius, and similarly the total mass. The analysis of the scaling relations of MUSIC clusters is completed by estimating the X-ray properties of the objects using PHOX. 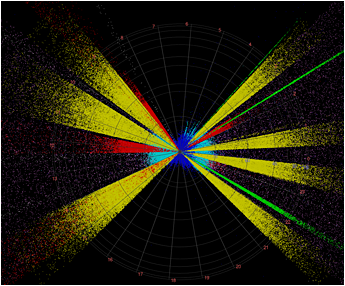 The X-band is considered to be the observational counterpart of the SZ effect. 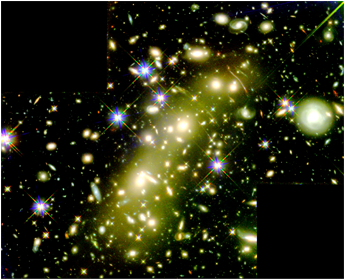 Beside the standard X-ray scaling relations, like the Lx-M and the T-M relations, a comparison between the X-rays and SZ properties of MUSIC clusters (focusing on scaling relations like the YX-Y and the Y-T relations) will be performed, in order to explore the relationship between galaxy cluster's properties with different observational approaches. Finally, I will use large N-body simulations, such as MultiDark and Big MultiDark, to check the evidence for motions of galaxy clusters and groups via microwave background temperature distortions due to the kinematic Sunyaev-Zel'dovich (kSZ) effect measured by ACT (Atacama Cosmology Telescope). Taking advantage of the extensive statistics provided by such large simulations, I will discuss the mean pairwise momentum of clusters from the bulk velocity and the mass of simulated clusters, studying its variation as a function of the cluster mass and of the distance between pairs of objects and underscoring that the observability of the signal grows as the separation decreases. 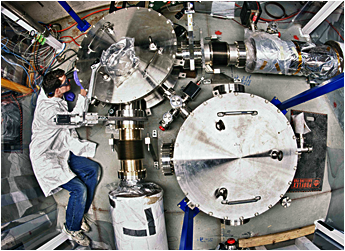 In this seminar, I will describe the Holometer, a small experiment currently under construction at Fermilab to study gravitational microphysics at the Planck scale 10^-33 cm. Black hole thermodynamics already provides some clues to what form this microphysics might take. The Bekenstein-Hawking entropy formula suggests that all information in our universe may be stored holographically on 2-dimensional surfaces rather than in 3-dimensional volumes. Even more startling to our world-view is the notion this formula implies, that the universe has a bandwidth limit of 1 bit per Planck area. Philosophical issues aside, the universal bandwidth limit may produce diffractive effects which become observable when the diffraction is allowed to grow over macroscopic distances to magnify the Planck-scale fuzziness of space-time. The Holometer is a Michelson interferometer-based device optimized to detect the resulting, characteristic position noise spectrum of objects apparently at rest in the space-time. Its relatively small 40 meter size, compared to that of large gravitational wave detectors, allows flexibility of reconfiguration to probe detailed properties of the predicted holographic noise. Weak gravitational lensing analysis is a powerful tool to investigate the dark Universe. 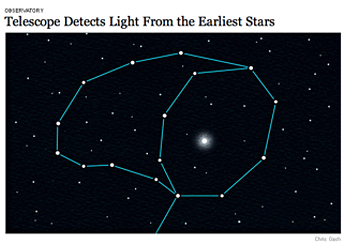 Next generation weak-lensing telescope surveys (e.g. 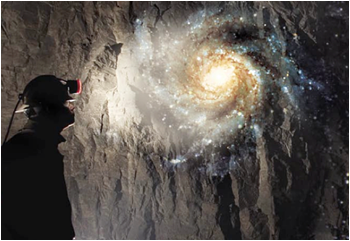 LSST, Euclid and WFIRST) promise to determine the equation of state of dark energy to 1% as well as probing the possibilities of extra dimensional gravity models and alternative cosmologies. To realize the potential of these new telescope surveys and to test new weak-lensing analysis techniques, challenges must be met. 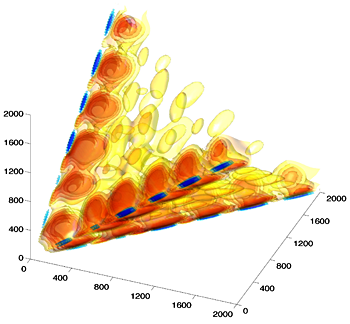 To achieve the small statistical errors required, experiments require full end-to-end simulations of huge volumes, which also probe the non-linear regime to assist in understanding the limitations of the analysis techniques. 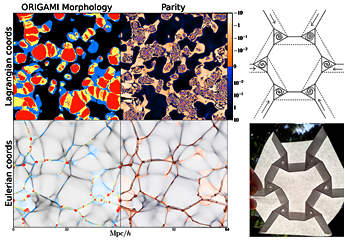 We have developed a new cosmic shear analysis pipeline SUNGLASS (Simulated UNiverses for Gravitational Lensing Analysis and Shear Surveys) that rapidly generates cosmic shear and convergence catalogues using N-body simulations. In this talk, I introduce the SUNGLASS pipeline and show how the SUNGLASS mock shear catalogues can be used in preparation for upcoming telescope missions and for analysis of existing observational data sets. The light emitted by stars throughout the history of the Universe is encoded in the intensity of the extragalactic background light (EBL). Knowledge of the EBL is important for understanding the nature of star formation and galaxy evolution. Direct measurements of the EBL are very difficult due to the intense zodiacal light and the Galactic foreground emission. High-energy gamma rays may interact with photons of the EBL and generate positron-electron pairs. This introduces an attenuation feature in the spectra of distant gamma-ray sources that has been used in the past to set upper limits on the opacity of the Universe and the energy density of the EBL. In this talk, we will report the first detection of an absorption feature seen in the combined spectra of a sample of gamma-ray blazars detected by the Fermi Large Area Telescope (LAT) out to a redshift of z>1.6. This feature is caused by attenuation of gamma rays by the EBL at optical to UV frequencies, and points to a minimal level of EBL, consistent with the observed star formation rate and with low-opacity EBL models. We will present the Fermi observations and discuss the implications for the generation of a diffuse UV background at high redshifts. We will also discuss recent measurements of the (nIR) EBL and present the prospects for a refined measurement of the EBL up to higher redshifts. results might be misleading due to numerical artifacts. As an example of this, I will discuss the case of Warm Dark Matter cosmologies and I will present a possible solution to these problems. The High Altitude Water Cherenkov (HAWC) Observatory is currently under construction on the slopes of Sierra Negra in the Mexican state of Puebla. 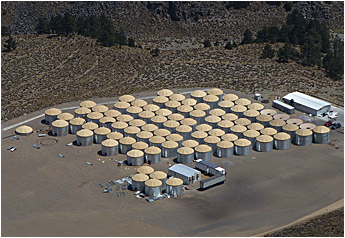 Scheduled for completion in August 2014, HAWC is designed to record air showers initiated by gamma rays and cosmic rays in the energy range from 100 GeV to 100 TeV. Of the full design of 300 water tanks, 30 are presently instrumented and have been taking data since September 2012. HAWC operates as a survey instrument with a large instantaneous field of view of 2 sr, complementing both ground-based gamma ray detectors such as VERITAS and space-based detectors such as the Fermi Telescope. I will summarize the design and construction of HAWC, discuss preliminary observations of the moon shadow and cosmic-ray anisotropy, and outline prospects for HAWC to contribute to gamma-ray and cosmic-ray science in the near future. 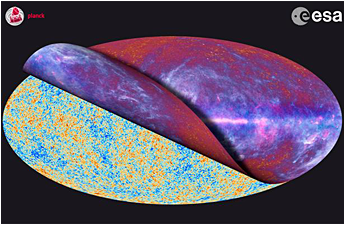 The results from the Planck satellite have provided excellent constraints on many cosmological parameters allowing us to constrain the physics of inflation. While all observations are currently consistent with the simplest models of inflation, many more complicated scenarios are also consistent with the data. 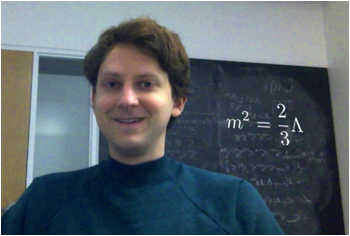 In this talk, I will focus on the theoretical aspects of multiple field inflation in light of the Planck data. I will give particular attention to the local bispectrum which is tightly constrained by Planck giving us non-trivial information about the physics of the early universe. 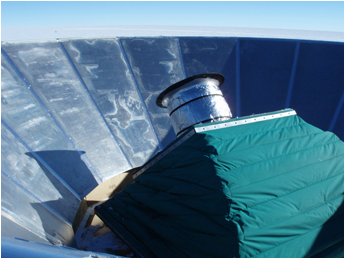 The BICEP telescope, which operated at the South Pole from 2006 to 2008, was the first instrument designed specifically to search for inflation by targeting the B-mode polarization of the Cosmic Microwave Background at large angular scales. Results from the first two seasons, published in Chiang et al. (2010), have so far provided the tightest upper limits on B-modes. We report on new results that incorporate the full three year data set to improve this constraint. 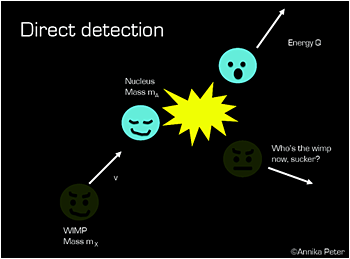 Besides including more data, the new analysis uses a novel method to deproject the largest source of systematic contamination in BICEP data. The successful design of BICEP is the basis of BICEP2, which operated at the South Pole from 2010 through 2012, and the Keck Array, which began observations in 2011 and is still operating. 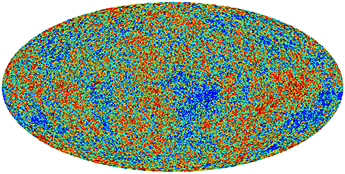 These experiments are currently producing extremely deep maps of CMB polarization. 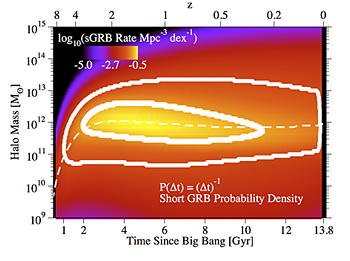 I will review the present state of confusion concerning the ~10 GeV region in WIMP parameter space, with emphasis on the experimental uncertainties. Lots of those. We'll briefly allow ourselves to look at the light at the end of this tunnel (i.e., will discuss incoming information that should lead us out of the present impasse).